indie game development adventures: Tech Support and why Piracy websites are a Good Thing aka "When Tech People call Tech Support"
Tech Support and why Piracy websites are a Good Thing aka "When Tech People call Tech Support"
I hate calling Tech Support, and I get the feeling I am not alone. This is coming from someone who was a "customer care" agent, tech support shill, and whatever else titles that deal with incoming, angry phone callers. I just want to start here by saying, I sympathize with most customer service and tech support people, I've been there. While many times hilarious stories come from this sort of job, most of the time, you go home incredibly frustrated. Frustrated with customers, your boss, corporate policy, the inability to actually help people that really need or deserve it, the long hours, the insane call time quotas, all sorts of things. This job usually isn't physically demanding, but you better like people and be ready for your chain of command to throw you out the door when you don't perform up to par as set by their overlords. Never mind the people factor, we're all robots that read scripts and can't actually help anyone that doesn't fit the pre-fabricated script as presented! I'd love to say #firstworldproblems here, but ironically, more and more of these jobs are now overseas in less-than-first-world areas... so yea. Which of course only adds to the layers of fun we get to go through when calling these companies that deploy this "support" strategy. Today's adventure was to Samsung. I had high hopes here since I generally like their products... but oh boy. I'm an App Developer developing on the Android platform. I have to download and install a driver to get my Windows desktop to correctly talk to my Smartphone. What's the backstory? Why do I need the driver? Glad you asked. As part of the fun with developing for Android, sometimes the drivers bug out and your device stops being able to talk to your desktop; it doesn't happen often, but when it does, it can be... unpleasant to get to work again. Strangely, the USB connection still works to transfer files around, but the development abilities are crippled and non-functional... joy. This is what happened, everything was working fine yesterday, then BOOM, my phone *refused* to talk to my computer and its development environment through ADB. After a bit of troubleshooting myself, I figured the drivers themselves had to be uninstalled and reinstalled... which leads me to today's fun and festivities. Before bothering going to any website, I have to do local troubleshooting, make sure I'm not an idiot and broke my own thing. Normally, with Samsung devices, I had been using their Kies Software to manage my phone from my computer (including installing drivers for it a year ago or so). Assuming this was the correct procedure again, I tried to do it again. Kies3 claimed that reinstalling the driver was successful, but instead, it was unable to download the driver from Samsung's website, but failed to tell me that. Instead, a NULL driver was installed for my phone. I ended up going through Control Panel -> System, checking out the unknown devices and looking through the Event Log to see Windows complaining about invalid drivers. Hurray. Great, so Kies was broken and it didn't know it was loading bunk drivers. Time to go to Samsung's website to manually get a driver (I hope). In theory, it sounds great. But this time, things went a tad amiss. It wasn't long before I came across Samsung's page for my phone, great, this shouldn't be too bad. To make things better, there is a pretty clear way to snag the driver that I need, cake! Clicking the download is where things started falling apart. Naturally, the message of "Samsung has no responsibility blah blah blah" comes up -- Continue. Well, my Internet connection seems to be fine, but I can't rule out my DNS settings are messed up or something, so let's check it. Hmm, apparently, I may not be the only one completely unable to get to their download center. I suppose this is why the Kies software manager thing couldn't get the driver either -- the website was unavailable to download from! I certainly wish it told me this, rather than having to find this out the hard way, and then having to manually uninstall bogus drivers and all that jazz. Some quick, frantic googling for my phone's driver didn't turn up much... plus downloading drivers from 3rd party websites really bothers me... so, I can wait this out and hope Samsung fixes their issue... take a risk with possibly getting virused with 3rd party sites... or... the worst option of all -- contacting tech support. Strolling through their website already indicated I won't be talking to native English speakers. Some broken English littered their website really didn't help my confidence. I'm assuming I'll be talking to the Phillipines or Cambodia or something. (In a major, surprising side note, the last time I called the Philippines to get support for TIME WARNER CABLE -- the phone support was actually pretty damn good; I was really shocked, mostly because the guy on the other end went off his script when he realized I knew what I was doing with networking tech, and actually listened to me and we actually worked together to resolve the problem, wow!). Oh, the website also offers live chat on their website - great, anything but phone support. Oh, that doesn't work either... of course, it must be hosted by their offline download center which is broken. So, here we are, I have to be productive today and get some new App code loaded on my phone. I seemingly have little choice but to bite the bullet and... call tech support. I'll give Samsung some credit here, at least finding a way to Contact them wasn't too cryptic. God knows this alone can be almost impossible for some companies. So, I called the help line for Mobile Phones (I'm assuming this was the correct number, since I'm not sure if this is a website specific issue). I certainly hate being stuck in a call queue for an hour, only to be transferred around in to phone support hell. Thankfully, the phone I'm calling on is the phone I need support for and it has speakerphone. So, we're prepared for the long battle ahead. The standard litany of a dozen automated phone options comes up -- first, wait (for English), 1, 1, 1, 1, 1, 1, 3... uhh, don't know how to answer that, so I guess that one sounds good, I think that will get me to a person. I hear the phone system click over and complete silence for a couple seconds... great, here we go. Time to get snacks and some water, we're digging in for the... oh wait, someone answered the phone already?! This can't be right. So far, you're winning Samsung. Though, as expected, we have someone with a heavy Asian accent. I don't necessarily mind this, but they need to slow down when they talk and enunciate a tad better... and apparently listen better. I explain to the guy that I need to download the USB driver for my phone to load Apps on to it from my computer, but the website is broken and it cannot be downloaded. "Ok, you want to download USB Drive to your phone". "No, I want to download the driver to MY COMPUTER so it can talk to my phone." "Ok, so, you want to download USB Drive to your phone"
"No, I need to get the USB driver FROM YOUR WEBSITE, WHICH DOESN'T WORK". "Ok, so you are having trouble downloading the drive?". "YES". (well, the driver, but hey, whatever). He verified my phone number, my name, it was my first time calling Samsung, etc. Apparently, he claimed to "have checked to website, it was fine". Well, that's nice that HE can get it, but the fact is, *I* certainly couldn't. As tech support would go, he decided (probably by a script) to walk me through traversing Samsung's website to get to the driver. Great, I don't think I had the heart to reiterate to him that I've already done this, hence why I'm calling him... but hell, who knows, maybe he has a different way of getting this. Sure enough, he had me type in my model in to the search, which brought up my phone model eventually (I had a lost-in-translation error as he was spelling out what to type in, leading to garbage search results for a little while, so yea, I messed up too). He had me click on things, etc, then told me "It should be downloading now!". Well, it would have been if I didn't get the same error I already told you. Of course, as a tech guy, we can't assume the customer actually knows what they are talking about, so we have to assume their internet might not be working or there are other issues (certainly it can't be the company's problem, that's absurd!). At this point, I'm getting a tad annoyed, but hey, this guy is doing ok so far. But THIS is where things went really south, really quick. First, he claimed he could download it, and so it has to be my problem -- ok, fine, I get you don't trust me, that's fine... but then he insisted that he could remotely control my computer to fix things for me. Wait, what the hell?! He talked about how he can log in to my system, control everything and fix it. Whoah buddy, I don't want you remote controlling my computer (especially when I know nothing is wrong with my system!). Now, mind you, I do this EXACT thing for my friends and family for their tech support needs. I certainly don't want a company in who-the-hell-knows-where to just jump on my system to fix "my problem". Aside from the security standpoint, I'm not sure this guy knows that I have a fairly hardened network connection to the Internet, it wouldn't be completely trivial to allow him on my system to just fix a problem (that isn't even mine, from what I can tell). I was a tad insulted, shocked, and I'll be honest, kind of angry that he would even suggest this. I can understand that if you don't want to deal with customers and walking them through tripe things (click on the X in your window) it is much faster and easier to just do it for them -- fine, I get it. BUT this is somebody I don't know, I don't know if they have to install some sort of remote control software or what -- in fact, this raises more questions than it answers in and of itself -- does some sort of software from Samsung need to be installed to allow this remote control access?? Is this already enabled in other software in my system?! Now, I'm actually fairly curious. Maybe I'll set up a virtual machine and feign another problem to call them back just to see what would happen here. Maybe it was just windows remote assistance or something else; who knows. I suggested that he download the driver and possibly email it to me instead? He said he couldn't do that -- of course. So, I told him I wasn't comfortable with him doing the remote control shenanigan, he said he understood and that it was possibly my Internet browser was at fault -- right, Chrome didn't like your download center's website; nevermind my ping tests or other things I've done to isolate the problem to Samsung's services. So, while the guy was going on and on about things I should do, I saw that the URL from the [broken] download center's URL had the file name of the driver I was looking for -- finally, I could google for that directly and just find it somewhere else. Boom, sure enough, file sharing/piracy sites have the file in question. At this point, it was pretty clear Samsung would be unable to help me with their problem, much less even know about their own problem, or care to know, apparently. I don't blame the tech guy, he was following his scripts, and he was probably quite frustrated with me, so I told him he couldn't help me and that I will be going to 3rd party websites to get the file in question. He verified that was to be our resolution and then bid farewell. Thank god for piracy websites hosting this file somewhere else... now to hopefully not virus myself and this will be another fine tech support issue solved in clearly the most efficient way possible. Samsung's final tech support experience tally? He followed his scripts, was generally nice, spoke way too fast, didn't listen to what I had to say most of the time and probably wasn't super technical himself as he clearly didn't understand what I was telling him most of the time -- granted, I was probably unlike most people calling him, having problems with their apps or whatever, so I'll give him the benefit of the doubt. You want to remotely control my computer to overcome issues of communication? There's no other way to get your file? Do you not care that your downloadcenter is broken to external customers? I have to make assumptions that the internal support policy... needs work. Surprising I know, but overall, their site was laid out well enough to where I could get where I wanted to go fairly easily. I wanted support, it was fairly straightforward to get there. Oh, and the filename of the driver I needed being in the URL, excellent. You saved me from having to deal with your own internal issues! 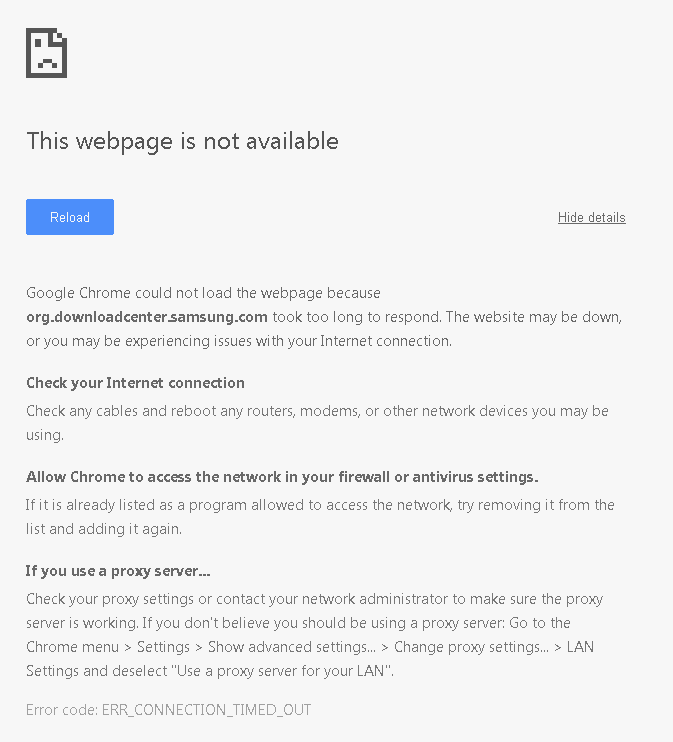 A major portion of your website is possibly broken and nobody at Samsung apparently knows about it? I guess it is like your Kies software, seemingly works well, but when a something goes wrong, it does you the favor of not letting you know about it! Not the worst I've experienced, but a far cry from where I would hope to be from a company like Samsung. I'm under the assumption a firewall rule was potentially blocking external traffic -- possibly specific to the United States, maybe everywhere else, Kim Jong Un under the hood? Who knows... now let's hope I don't get virused and actually get back to work.